WASHINGTON, DC -- Green Party leaders spoke out today about the budget impasse, government shutdown, bipartisan plans to scale back Social Security and Medicare, and looming negotiations on the debt ceiling. Greens emphasized that the Affordable Care Act, which remains at the center of the stalemate between Democrats, traditional Republicans, and extremist Tea Party Republicans, must be replaced with a single-payer national health care system ("Medicare For All"). • James Lane, Green candidate for Public Advocate of New York City (http://www.VoteJamesLane.org): "After the shutdown ends, Congress and the White House will deal with the debt ceiling, but we can count on both Democratic and Republican leaders to ignore the major cause of the nation's rising debt -- the bloated military budget and President Bush's unfunded wars. The ceiling was enacted in 1917 to protect U.S. taxpayers from the financial cost of war and the tendency of presidents to go to war without raising money to pay for it. The invasions of Afghanistan and Iraq were accompanied by massive tax cuts for the wealthy and followed by the economic collapse and bailout of Wall Street. Instead of cuts to food stamps, Medicare, Social Security, and other sorely need social programs during the lingering recession, we need deep reductions in military spending. Greens have called for elimination of hundred-billion-dollar subsidies for defense contractors and a halt to military strikes on countries that haven't attacked the U.S. Defense spending should only cover the immediate defense of U.S. borders from outside attack and continuing services for veterans." See "Giant Pentagon Budget Is Unauditable Year After Year" by Ralph Nader, The Huffington Post, Oct. 4 (http://www.huffingtonpost.com/ralph-nader/pentagon-budget_b_4046370.html); "Burlington City Council vs. The Military Industrial Complex" by Leah Bolger, Secretary of Defense in the Green Shadow Cabinet, Oct. 6 (http://greenshadowcabinet.us/statements/burlington-city-council-vs-military-industrial-complex); "Cutting the Pentagon Budget: A Step to Curbing Climate Change and Healing the Planet" by Mark Dunlea, OpEdNews.com, April 19 (http://www.opednews.com/articles/Cutting-the-Pentagon-Budge-by-Mark-Dunlea-130419-732.html). • Steve Welzer, Green candidate for Governor of New Jersey (http://www.WelzerForGovernor.org): "President Obama will not compromise on the Affordable Care Act, his most significant first-term legislation, and allow a one-year delay in its funding. But we're in danger of seeing the President and Democratic leaders cooperate with Republicans in slashing other social programs, especially Social Security. His National Commission on Fiscal Responsibility and Reform has already recommended reductions in Social Security -- sacrificing financial security for millions of older Americans. This would fulfill a long-time goal of Republicans and financial-sector lobbies who want to see our retirement money gambled in high-risk Wall Street securities. 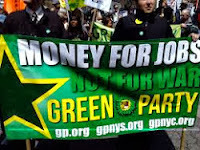 Greens oppose any more bipartisan 'grand bargains' that impose austerity and place the burden for economic recovery on working people and the poor. The projected shortfall in Social Security later this century can be corrected with a modest rise in the contribution cap for high-income Americans." See "Who Will Hold the Line if Dems Offer Cuts to Social Security, Try for 'Grand Bargain'?" by Jon Queally, Common Dreams, Oct. 4 (http://www.commondreams.org/headline/2013/10/04). • Darryl! L.C. Moch, co-chair of the Green Party of the United States: "While Greens reject the GOP's irrational claims and misinformation about the Affordable Care Act, there are serious problems with the legislation that can only be fixed by enacting single-payer national health care. The ACA offers some important reforms, but it isn't universal health care and it does little to control skyrocketing medical costs. Instead of low-quality insurance for working people under the ACA's individual mandate, which feeds the health-insurance industry, we need to replace for-profit insurance with Medicare For All, which will provide quality medical care for everyone and free choice of physician and hospital. After the shutdown ends, we must resist the predictable claim of Democratic leaders that a Republican retreat on the ACA is a victory for everyone who opposes the Tea Party and we shouldn't complicate that victory by demanding Medicare For All." See "Health Care for All: Why We Need a New Prescription" (interview with Dr. Don McCanne of Physicians for a National Health Program) by Scott Tucker, Truthdig, Oct. 1 (http://www.truthdig.com/report/print/health_care_for_all_why_we_need_a_new_prescription_20131001) and "Reasons to Lose Sleep over the Shutdown and Obamacare" by Scott McLarty, Common Dreams, Oct. 6 (http://www.commondreams.org/view/2013/10/06). • Katey Culver, co-chair of the Green Party of the United States: "Government shutdowns, austerity, sequestration -- these manipulations are the result of a system in which Democrats and Republicans only have to negotiate with each other under influence from powerful corporate lobbies and campaign contributors. They can afford to ignore the interests of most Americans. When we have a strong bloc of Greens in Congress and state legislatures, this dynamic will change. 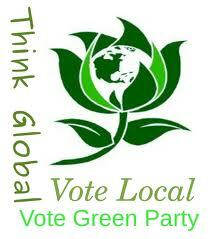 Both Democrats and Republicans will want to negotiate with Greens as the fulcrum in the balance. We're a party supporting the interests of working people and the poor and we accept no corporate money, we remain true to our values. 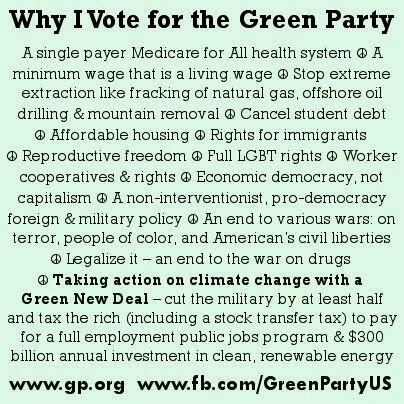 When we have a multi-party democracy, with everyone represented, the U.S. will have the political will to create economic security for working Americans, end militarism, restore our rights, and address crises like climate change." See "‘Let’s stop this government-by-extortion’ - Green Party’s Stein on U.S. shutdown" (video interview), RT, Oct. 2 (http://rt.com/usa/stein-green-party-shutdown-655).